Over the next few days, Nike Golf athletes will be taking their talents across the pond to play in the Open Championship at Royal Liverpool in North West England. Thought the course is challenging on its own, the weather can present its own set of challenges. 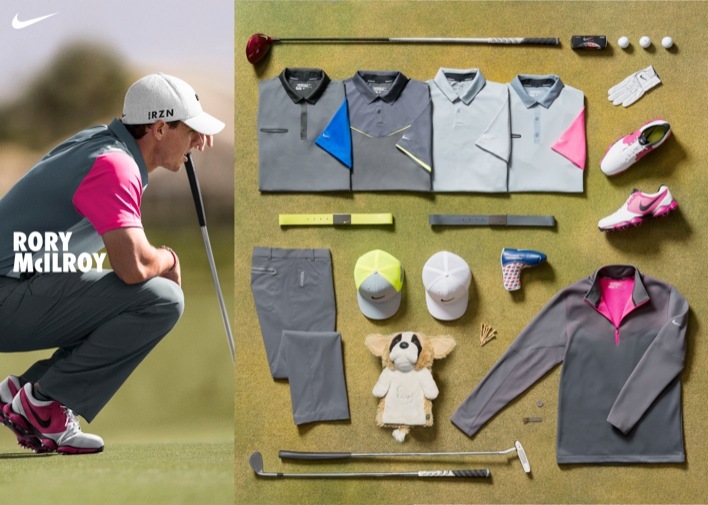 More apt to a Fall round of golf, Nike Golf has presented a collection of offering for their athletes to keep them ready for the predictably chillier temperatures and blustery conditions. Nike will have a total of 11 athletes playing in the Open Championship with 7 players wearing the Lunar Control, a couple wearing the FI Impact, and Tiger wearing the TW’14. Tio keep them warm, Nike will offer up the TW Engineered Sweater or the 3D V-Neck Sweater. Take a look below for a full rundown on the gear the athletes are wearing. 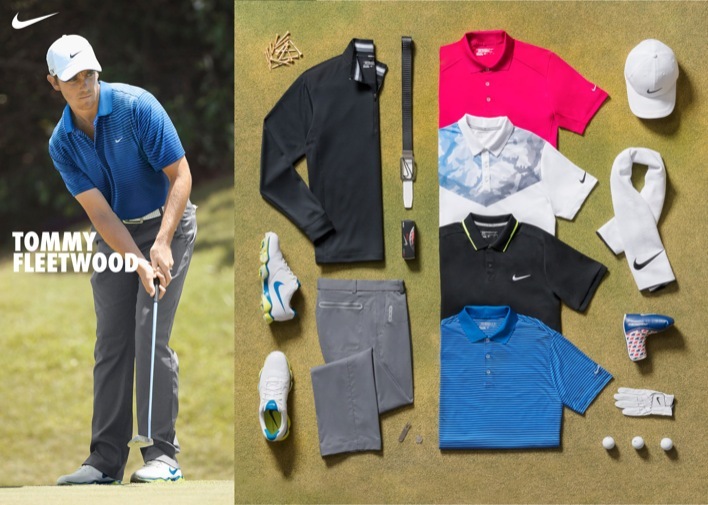 For added warmth and layering, Woods will also sport the TW Tech 2.0 Cover-up ($130). Underneath, he’ll wear polos from the TW collection: TW Seasonal Bold Stripe polo ($90) on Thursday; TW Engineered Body Map polo ($100) on Friday; TW Seasonal Bold Stripe polo on Saturday; and TW Ultra Polo 3.0 ($95) on Sunday in his signature red hue, Action Red. 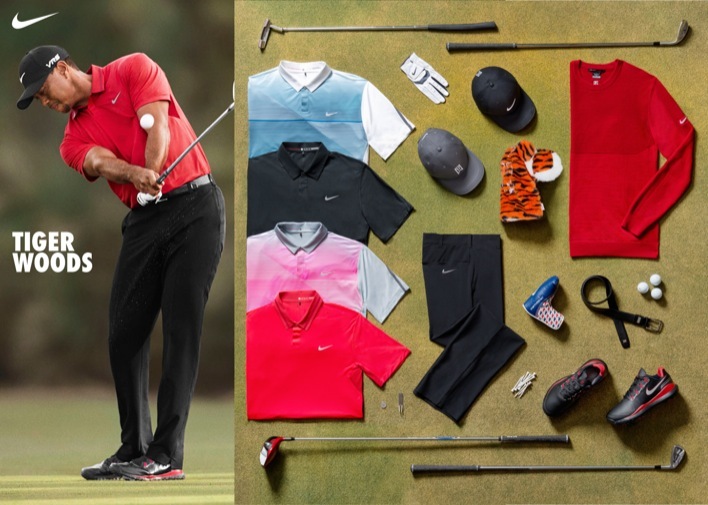 Woods will finish each look with the TW Adaptive Pant ($125), TW Ultralight Tour cap ($30), TW Mesh Nike belt ($70) and Nike TW’ 14 footwear ($220). Driver and ball: Nike VRS Covert 2.0 Tour and Tour One D.
Underneath the Hypervis Half-zip Cover-up, Rory will sport a variety of polos featuring the mobility chassis, a shoulder seam that is shifted toward the upper back that allows for maximized movement and eliminates distraction. He’ll start and finish the week in the Lightweight Innovation Color polo ($75) – the same design he wore at Augusta and Pinehurst – in addition to Friday’s Innovation Color Block polo ($75) and Saturday’s Innovation Vent 2.0 polo ($75). He’ll complete each look with the Modern Tech pant ($80), Tour Mesh cap ($30), Sleek Modern Plaque belt ($50) and Nike Lunar Control footwear ($200). Driver and ball: Nike VRS Covert 2.0 Tour and RZN Black. England’s Casey will pair his 3D V-Neck sweater with the Lightweight Innovation Stripe polo ($65) and Key Iconic Polo 2.0 ($65) on Thursday and Saturday when he returns to his home country for The Open. On Friday he’ll wear the Lightweight Innovation Cool polo ($65), and suit up in the Key Bold Heather Stripe polo ($65) on Sunday. Casey will also wear the Flat Front Tech pant ($80), Stripe Novelty pant ($85), Ultralight Tour Legacy cap ($30), Signature Swoosh Logo Cutout II belt ($45) and Lunar Control footwear. Driver and ball: Nike VRS Covert 2.0 Tour and RZN Platinum. 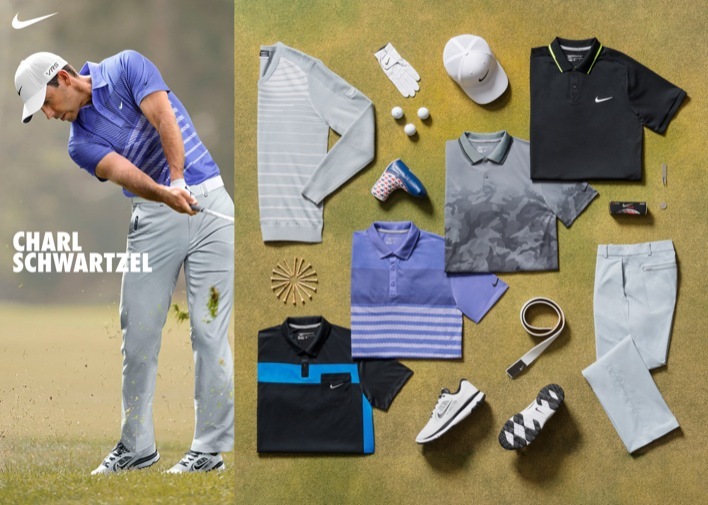 Schwartzel will wear a collection of sporty polos featuring bold graphics including camouflage and bright colorblocking: The Sport Innovation Pocket polo ($70) on Thursday, Sport Stripe polo ($65) on Friday, Sport Nike Graphic polo on Saturday, and Sport Swing Movement polo on Sunday. He’ll stay protected from the chiller temperatures in the 3D V-Neck Sweater and Sport Long Sleeve Crew ($80). 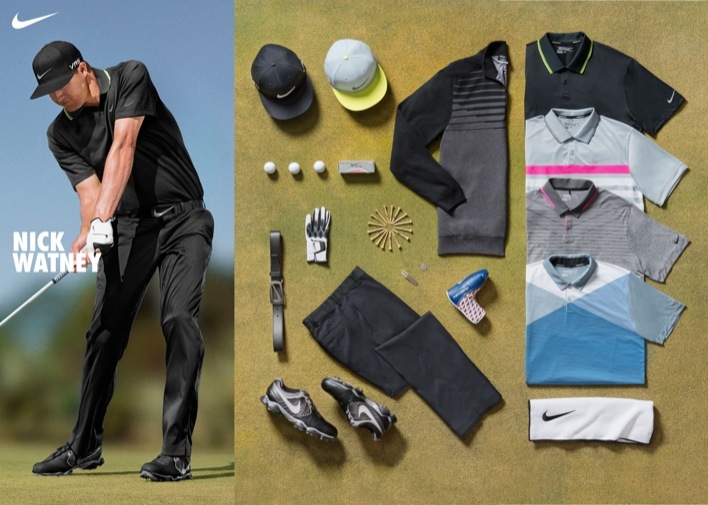 Nike Golf’s Modern Tech Pant, Tour Mesh cap, Sleek Modern Plaque belt ($50) and FI Impact footwear complete each head-to-toe look. Driver and ball: Nike VRS Covert 2.0 Tour and RZN Black. Fleetwood will compete in his native England wearing the Nike Victory polo ($50), Sport Seasonal polo ($70) – featuring Nike’s iconic and running apparel-inspired 26-degree angle design on the upper chest, Sport Swing Movement polo ($60) and Nike Victory Stripe polo. To complete each look, Fleetwood will pair polos with the Modern Tech pant, Dri-FIT Performance Half-zip cover-up, Ultralight Tour Legacy cap, Square Perforated Reversible belt ($55) and Lunar Control footwear. Driver and ball: Nike VRS Covert 2.0 Tour and RZN Black. 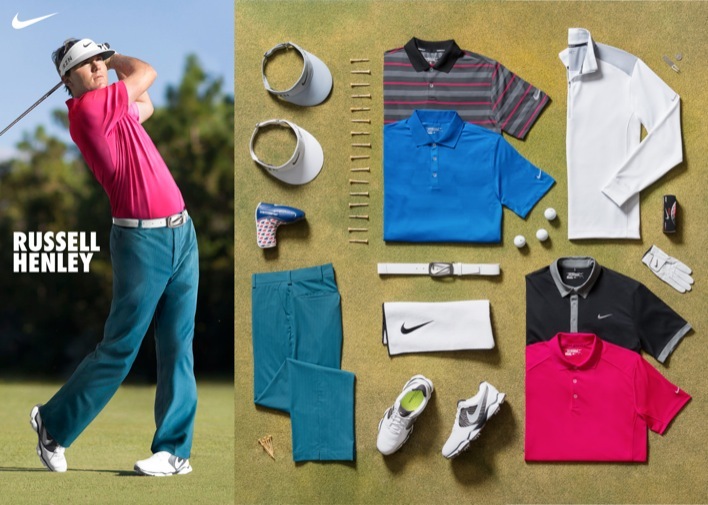 The 2001 Open Championship winner will stay protected in the Dri-FIT Performance Half-zip cover-up ($75), Nike Victory Stripe polo ($55), Nike Ultra Polo 2.0 ($65), Key Bold Heather Stripe polo and Key Body Mapping polo ($65). He complete his head-to-toe look with the Flat Front Tech pant, Nike Golf Plaid pant ($85), Tour Mesh cap, TW Mesh Nike belt, and Lunar Control footwear. Driver and ball: Nike VRS Covert 2.0 Tour and RZN Platinum. 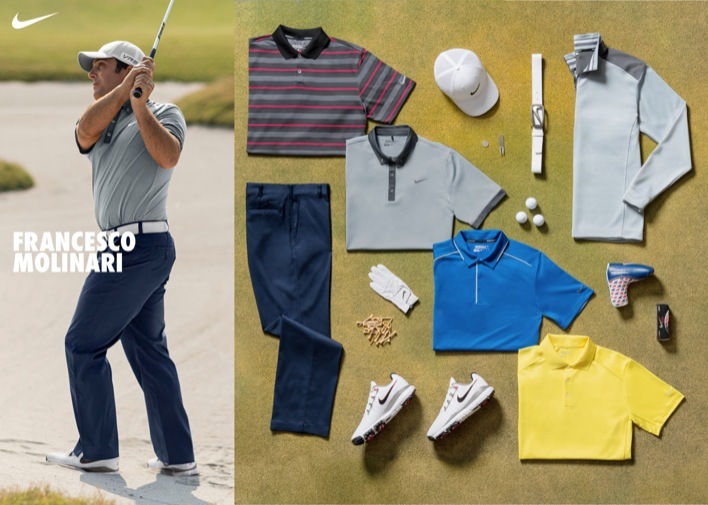 Molinari will stay warm with the Dri-FIT Performance Half-zip Cover-up, layered over the Nike Ultra Stripe polo, Nike Ultra Polo 2.0, Key Iconic Polo 2.0 ($65) and Nike Victory polo. He’ll lace up in TW’ 14 footwear and pair each polo with the Flat Front Tech pant, Stripe Novelty pant, Tour Mesh cap, and Signature Swoosh Logo Cutout II belt. Driver and ball: Nike VRS Covert 2.0 and RZN Black. In the hunt for his first Major Championship, Watney will wear a range of bold graphics and designs, including Sunday’s Innovation Mesh Sub polo ($70). He’ll round out the weekend with the Innovation Jacquard polo ($75) on Thursday, Innovation Stripe polo ($70) on Friday, and Nike Premium Jacquard polo ($110) on Saturday. The 3D V-Neck Sweater, Half-zip Wind-resistant sweater ($150), Dri-FIT Wool Tech sweater ($90) Flat Front Tech pant, Flat Bill Tour cap ($30), Signature Swoosh Logo Cutout II belt and Lunar Control footwear will finish each look. Driver and ball: Nike VRS Covert 2.0 and RZN Platinum. 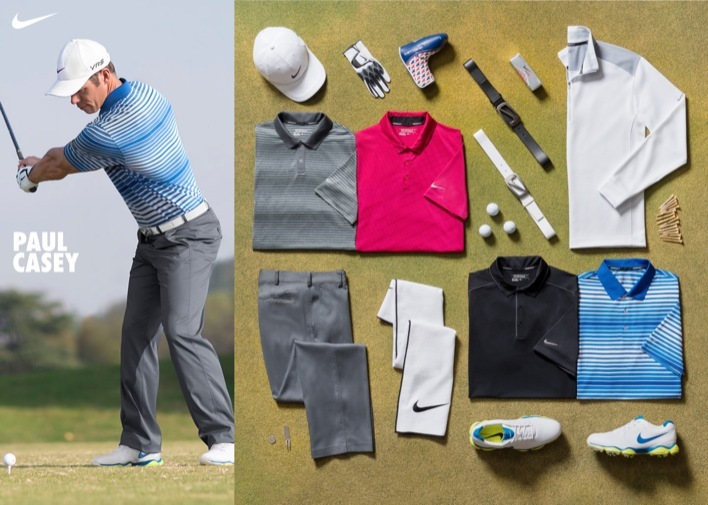 The University of Georgia alum will kick off his quest for the Open Championship trophy sporting the Nike Ultra Stripe polo ($60) on Thursday, followed by the Key Body Mapping polo, Nike Ultra Polo 2.0 and Nike Victory polo. 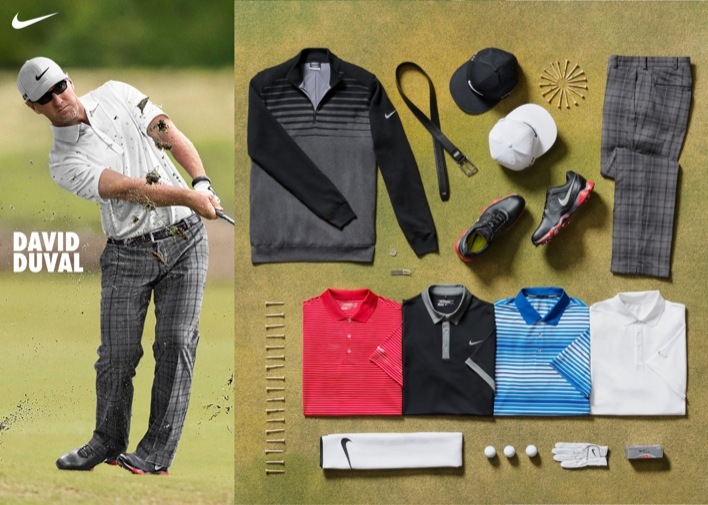 He’ll wear a mix of solids, stripes and plaid with the Flat Front Tech Pant, Nike Golf Plaid Pant and Stripe Novelty Pant. A Dri-FIT Performance Half-Zip cover-up, Signature Swoosh Logo Cutout II belt, Tall Tour visor ($22) and Lunar Control footwear will complete each look. Driver and ball: Nike VRS STR8-FIT and RZN Black.